Australia 2013 - It will all end here! I decided on the exact start point of the run across Australia (The Indian Ocean at Cottesloe Beach) a little over 12 months ago. I've always said that I'd finish the run on Bondi Beach. I can now confirm the exact part of Bondi Beach that will be the finish line for the run across Australia. When I say "beach", I really mean the point where I'll be entering the Pacific Ocean! The image above shows the final few hundred meters that I'll be running. 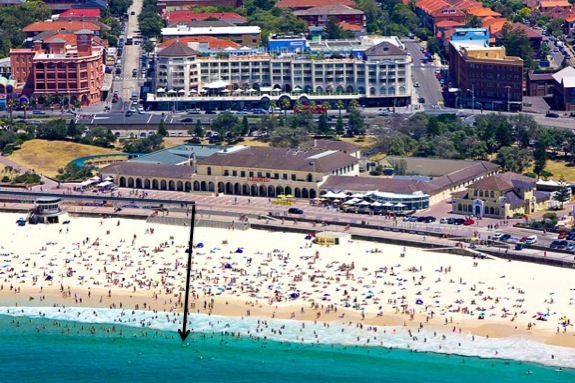 Once I reach Bondi Pavilion, I'll make my way down the steps, past the life guard station and into the Pacific Ocean. Just like the run across the USA, this will be a true coast to coast run and is scheduled to finish at 17:30 local time (07:30 GMT) on the 24th of December 2013. Watch this space in the coming months for further details of how you can get involved at the finish line on Bondi Beach. Run Geordie Run t-shirts have been posted all over the world over the course of the last few weeks. 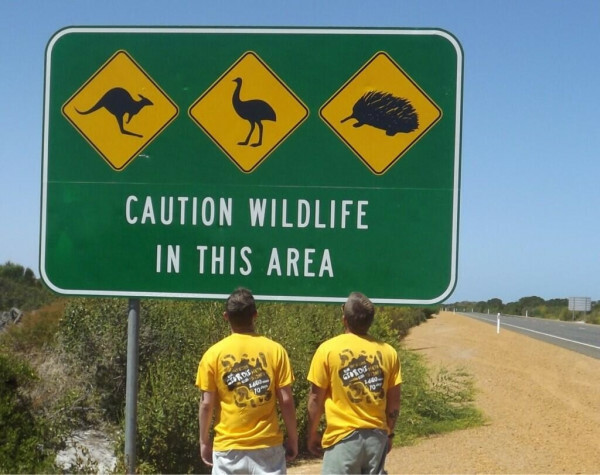 I was quite surprised that 40 or so t-shirts have have ended up in Australia and New Zealand. The picture below shows Geordies Glen Bruce and Gav Wallace checking out the sights on one of the roads that I'll be running on. 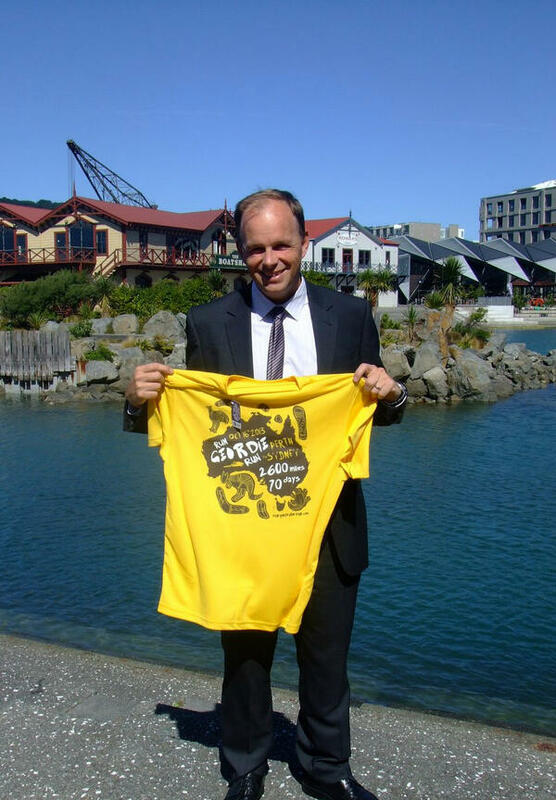 Meanwhile in sunny Wellington, New Zealand, Peter Jones is seen below showing off his new Run Geordie Run t-shirt. 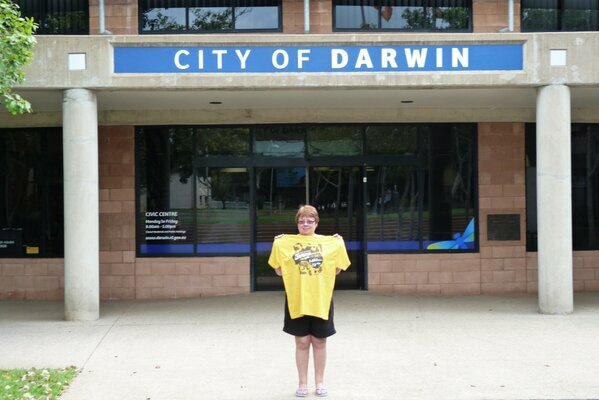 Finally, Julie and Malcolm Preston are seen below with their Run Geordie Run t-shirts in Darwin, Australia. Please send your Run Geordie Run t-shirt photos to sponsorship@rungeordierun.com and I'll do my best to include them on the site. 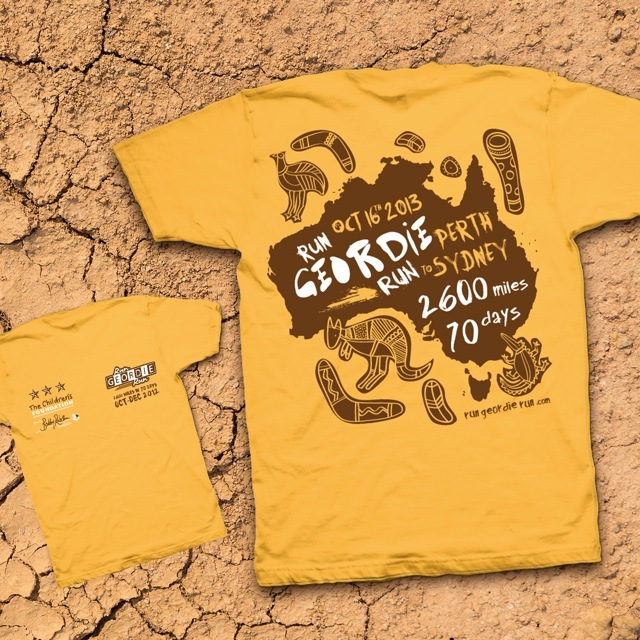 I'm pleased to report that all Run Geordie Run Australia 2013 t-shirts are now sold out in aid of The Sir Bobby Robson Foundation and The Children's Foundation. 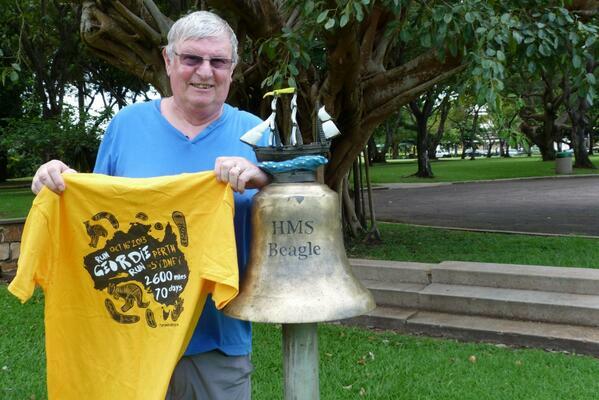 T-Shirts sales have made £2600 for the 2 charities and, as a result, the fund currently stands at £10,832.17. The t-shirts were paid for by Benfield Motor Group and designed free of charge by Dave Shenton of Shenton Creative. It's because of this that every single penny that was paid for t-shirts went to the 2 charities. Thank you to everyone who bought a t-shirt. If I can get funding for any more there will be a brand new design available in the Summer. Watch this space. I'll be putting the "SOLD OUT" signs up on the Run Geordie Run t-shirts this Friday (probably sooner if they all get snapped up before then.). All of the technical t-shirts sold out a few weeks ago but there are still MEDIUM and LARGE cotton t-shirts left. Thanks again to Benfield Motor Group for paying for the production of the t-shirts and also to Dave Shenton for the snazzy design.